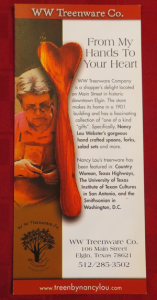 We are happy to bring to you the awe-inspiring treenwares of the celebrated Nancy Lou Webster, owner and founder of the WW Treenware Company of Elgin TX. Nancy Lou’s treenware has been featured in: Country Women, Texas Highways, The University of Texas Institute of Texan Cultures in San Antonio, TX, and the Smithsonian in Washington, D.C.
We have the one-of-a-kind crosses in various shapes and sizes. All crosses are hand whittled and takes from 3 to four hours to complete. They are made from Oak, Cider or Misquote.